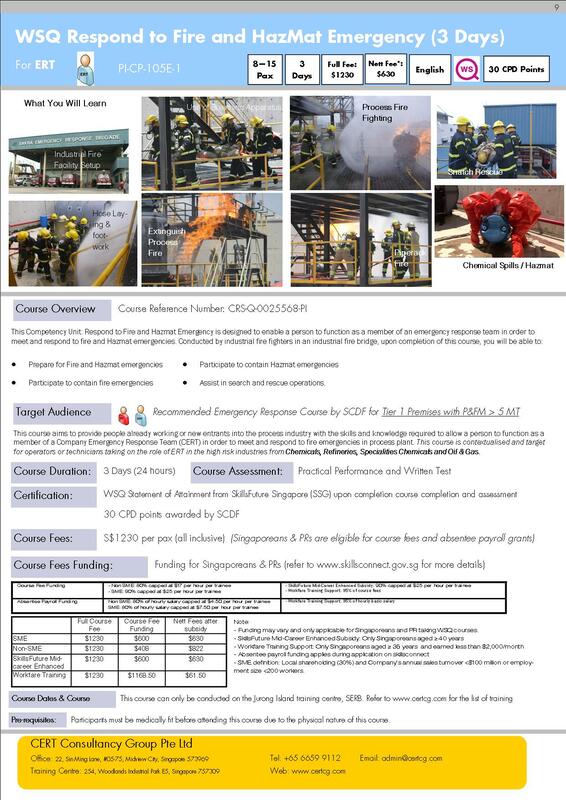 This course aims to provide people already working or new entrants into the process industry with the skills and knowledge required to allow a person to function as a member of a Company Emergency Response Team (CERT) in order to meet and respond to fire emergencies in process plant. This course is contextualised and target for operators or technicians taking on the role of ERT in the high risk industries from Chemicals, Refineries, Specialities Chemicals and Oil & Gas. - Funding may vary and only applicable for Singaporeans and PR taking WSQ courses. - Full fees payable to training provider and funding will be claimed directly from skillsconnect. - SME definition: Local shareholding (30%) and Company’s annual sales turnover <$100 million or employment size <200 workers.